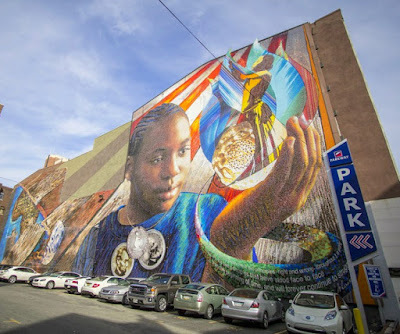 Philadelphia is known as the city of "Brotherly Love" and "America's Birthplace", but did you also know that Philadelphia is home to the "Worlds Largest Outdoor Art Gallery?" There are more than 3,800+ outdoor wall murals in Philly and that number continues to grow. The murals are collaborations between the City of Philadelphia Mural Arts Program and local citizens. You'll find thousands of beautiful murals painted on the outside walls of various buildings throughout the city. The mural that we're featuring in our travel post today is officially titled the "LINCOLN LEGACY" and you'll find it located on 707 Chestnut Street, in the Center City district, 2 blocks from the famous Liberty Bell Center. It's a 10,000-square-foot mural composed of more than 1 million, 3/4-inch glass tiles...all laid down by hand. As you stand there looking at the mural you'll notice that the design depicts a girl holding the flame of liberty. Around the girl's neck are two beautiful medals depicting Abraham Lincoln and Frederick Douglass, and an 1838 abolitionist coin from England. It was completed on January 1st, 2016 by the very talented artists named Josh Srantitis and Eric Okdeh. It was produced by a collaboration of 5 public schools and dozens of individuals, who hand-laid over 1 million small glass titles on the mural’s right side. If you want to get a good photograph of it, you'll want to arrive early in the morning to avoid a parking lot full of cars. It's one of the most popular wall murals in Philadelphia and attracts thousands of visitors every year.